In one of the largest investment transactions in Scotland in recent years, a vehicle associated with Starwood Capital Group, a private investment firm, has acquired the entire share capital of Abstract (Glasgow) Limited, the company which developed and owns the St Vincent Plaza office development in Glasgow. Terms of the transaction were not disclosed. The 12 storey BREEAM excellent EPC A office building which comprises 172,307 sq ft is multi let to a range of occupiers including KPMG, Whyte and Mackay, Scottish Ministers, Mott Macdonald, Wood Group and Zurich Insurance. The building was completed in late 2015 and is located in a prominent position on St Vincent Street opposite the new HQ for Scottish Power. There are strong levels of interest in the two remaining floors. Lambert Smith Hampton and CMS acted as financial advisors to Starwood Capital Group. Pinsent Masons acted for the shareholders of Abstract (Glasgow) Limited. Over the past 5 years Abstract has built or has under construction over 1 million sq.ft. of net lettable offices across the UK, together with a major office refurbishment of 250,000 sq.ft. making it one of the country’s largest regional developers. The Group undertakes development as a principal speculatively and for end users. Abstract also acts as a development manager under design and build arrangements and in joint venture partnerships. Abstract has gained a strong reputation for delivering award winning schemes, including its new range of “uncompromising value” offices. These buildings deliver high specification, Grade A space with top environmental credentials (BREEAM Excellent and EPC ‘A’ rated) with a tight design and procurement process, offering occupiers the best value and cost per workstation of any modern offices in their local market. Posted on October 31, 2017 by PETER RUPPERT. Zurich Insurance is the latest global occupier to commit to Abstract’s St Vincent Plaza office development scheme in Glasgow. The business is relocating its office from The Eagle Building in Bothwell Street in mid-2018 and will take the entire 7th floor of the development comprising 17,222 sq ft on a new 10 year lease. St Vincent Plaza is a speculative ‘Grade ‘A’ office development of 172,307 sq ft arranged on lower ground, ground and 10 upper floors. The building occupies a prominent position in Glasgow City Centre and has been designed to support highly efficient day one occupancy levels from 1 person per 6 sq.m. With a BREEAM ‘Excellent’ and EPC ‘A’ environmental accreditation, the development provides the most cost effective new build city centre office accommodation anywhere in the UK. Joint agents for St Vincent Plaza are CBRE and Ryden. St Vincent Plaza is a 172,307 sq ft building arranged on lower ground, ground and 10 upper floors. The building achieved a BREEAM excellent and EPC A rating. With the letting to Zurich, committed rent on the building is now £3.818m per annum, approaching 90% of the target rent. Only the ground floor, 12008 sq ft, and the first floor, 14902 sq ft remain to be let. 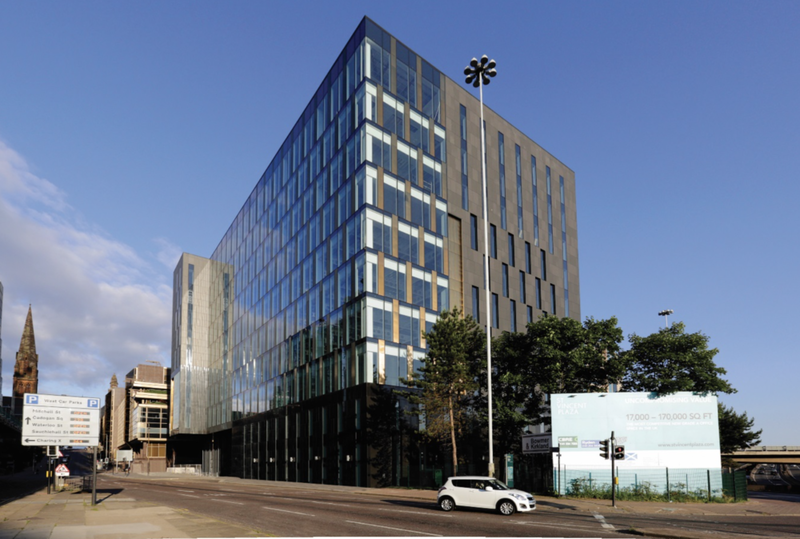 Wood Group is the latest occupier to commit to Abstracts’ St Vincent Plaza office scheme in Glasgow; joining confirmed tenants including KPMG, Whyte and Mackay, Mott MacDonald and Registers Of Scotland at the building, which was completed in late 2015. Wood Group’s clean energy business, SgurrEnergy, will occupy the second floor of the development comprising 17,249 sq ft from March 2017 on a long-term lease. St Vincent Plaza is a speculative ‘Grade A’ office development of 172,280 sq ft arranged on lower ground, ground and 10 upper floors. The building occupies a prominent position in Glasgow city centre and has been designed to support highly efficient day one occupancy levels. With a BREEAM ‘Excellent’ environmental accreditation, the development provides the most cost effective new build city centre office accommodation anywhere in the UK. GVA acted for Wood Group. Posted on March 7, 2017 by PETER RUPPERT. In the largest letting in Scotland since the EU referendum, global management, engineering and development consultancy, Mott MacDonald, has concluded terms to move to Abstract’s St Vincent Plaza office scheme. The business is relocating its office from 1 Atlantic Quay in mid-2017 and will take the entire 5th and 6th floors of the development comprising 34,515 sq ft on a new 15 year lease from February 2017. Plans for their fit out are well advanced and it is envisaged that work will begin shortly in advance of occupation in the summer. St Vincent Plaza is a speculative ‘Grade A’ office development of 172,280 sq ft arranged on lower ground, ground and 10 upper floors. The building occupies a prominent position in Glasgow City Centre and has been designed to support highly efficient day one occupancy levels from 1 person per 6 sq. m.
Mark Glatman, Chief Executive of Abstract, commented: “We are delighted to welcome Mott MacDonald to St Vincent Plaza. They join KPMG, Whyte and Mackay and the Registers of Scotland to add to an impressive list of occupiers in the building who see the fantastic quality of space we offer at such a competitive value”. Mott MacDonald’s Andrew Oldfield said: “We have been based in Glasgow for over 70 years and have been involved in some of the City’s most recognised infrastructure, including the Clyde Tunnel, Prestwick Airport and Strathclyde Light Rail. We also supported the successful delivery of the Glasgow Commonwealth Games in 2014. With almost 400 employees in the city we’re involved in projects across a diverse range of sectors including environment, power, water and transport, as well as buildings and infrastructure, working with clients such as Transport Scotland, Glasgow City Council and Scottish Water. Moving to St Vincent Plaza will provide a modern working environment for our staff and support our growth for years to come,” Andrew added. Christopher McPherson, Development Director of Abstract said, “It is great that Mott MacDonald have taken space here after a very thorough process and this is the second time we have let space to them in our new office developments in recent years. We have experienced a significant uplift in occupier interest in recent weeks and with no other new development taking place in the City in the foreseeable future, Grade A options for businesses looking to move within Glasgow are extremely limited. I don’t doubt that we will make further announcements soon. Posted on February 9, 2017 by PETER RUPPERT. Mark Glatman’s Abstract has completed another deal at its St Vincent Plaza development in Glasgow by letting the entire retail offering in the building to Coffee Republic. Coffee Republic is a leading coffee and fresh food chain with 25 outlets in the UK and a further 18 worldwide. The retail space comprises a unit of 2,136 sq ft sq. ft. which is being taken on a new 10 year lease. It is envisaged that fit out work will begin shortly in advance of occupation in early 2017. St Vincent Plaza is a speculative ‘Grade A’ office development of 172,272 sq. ft. arranged on lower ground, ground and 10 upper floors, which was completed late in 2015. The building is in a prominent position close to major transport routes in the centre of Glasgow and is now the new headquarters for KPMG in the City as well as Whyte and Mackay and Registers of Scotland. Christopher McPherson, Development Director of Abstract said, “Coffee Republic is a welcome addition to St Vincent Plaza. We already have a significant amount of people working from the building and the quality coffee and food offering provided by Coffee Republic will be very complementary to the wider tenant experience. This part of Glasgow City Centre continues to expand with completion of the new Scottish Power HQ opposite us last week and the first of 1,850 staff expected to start moving into the building imminently. The letting to Coffee Republic is a further demonstration of the growing strength of this part of the City. Colliers International represented Coffee Republic. Posted on December 8, 2016 by PETER RUPPERT. Abstract has completed another letting at its St Vincent Plaza development in Glasgow to a public sector body. The building will be occupied as the new Glasgow base for Registers of Scotland (RoS), a non-ministerial government department, and follows hot on the heels of recent lettings to Whyte and Mackay and KPMG. RoS will relocate from Hanover House in Douglas Street and will take the entire third floor of the development comprising 17,294 sq. ft. on a new 15 year lease from January 2016. It is envisaged that fit out work will begin in the coming months, with RoS moving in the second half of 2016. St Vincent Plaza is a speculative ‘Grade A’ office development of 172,280 sq. ft. arranged on lower ground, and 10 upper floors, that was completed late in 2015. The building occupies a prominent position in Glasgow City Centre and has been designed to support highly efficient occupancy levels from day one. With a BREEAM ‘Excellent’ environmental accreditation and an EPC B rating, the development provides the most cost effective new build city centre office accommodation anywhere in the UK. Christopher McPherson, Development Director of Abstract Securities said, “The letting to Registers is a further positive endorsement of this development. We have let almost 75,000 sq ft in the last few weeks and interest levels remain strong. We are now the only building in the City which can offer close to 100,000 sq ft of new ‘Grade A’ space in a variety of sizes. “Prospective tenants will not have the opportunity to take new space offering this combination of quality and value again – our pricing point is less than much of the second hand stock in the City. Image shows: St Vincent Plaza, Glasgow. The first phase of Aberdeen International Business Park is designed to accommodate around 2,400 employees with 1,200 car parking spaces and besides a variety of catering options, includes a gym, a sports hall, 2 squash courts, a medical facility, a nursery/crèche and a shop. Abstract agreed Scotland's biggest letting deal ever with the Norwegian company Aker Solutions on 335,000 sqft of office space in Summer 2014. The resultant investment was sold to Legal & General in October 2014 for a price in excess of £127m making this the second largest investment deal in Scotland for 2014. www.aibp.co.uk. Registers of Scotland (RoS) is the non-ministerial government department responsible for compiling and maintaining 17 public registers. These relate to land, property, and other legal documents. RoS is working to make their services greener, faster and more efficient than ever before, an ambition that is being progressed by their digital transformation project, changing RoS from a largely paper-based organisation to one that does everything digitally in the first instance. Their current projects include completing the land register and launching a new land and property information service, ScotLIS. Posted on February 1, 2016 by Przemek Czaicki. Professional services firm KPMG has concluded an agreement to lease the top three floors at Abstract’s St Vincent Plaza development in Glasgow. The global business has committed to relocate from 191 and 163 West George Street in 2016 and will take the entire 8th, 9th and 10th floors of the development comprising 39,705 sq. ft. on a new 15 year lease without break (with an option to extend) from January 2016. It is envisaged that their fit out work will begin early in 2016 in advance of occupation in the Autumn. Around 350 of KPMG’s Glasgow-based staff will move to St Vincent Plaza. The firm also employs more than 175 people at its UK Tax Centre of Excellence at 123 St Vincent Street in the city. St Vincent Plaza is a speculative ‘Grade A’ office development of 172,280 sq. ft. arranged on lower ground, ground and 10 upper floors, which was completed in September. The building occupies a prominent position in Glasgow City Centre and has been designed to support highly efficient day one occupancy levels from 1 person per 6 sq. m.
Mark Glatman, Chief Executive of Abstract, commented: “We are delighted to welcome KPMG to St Vincent Plaza. This is a huge endorsement of the Abstract approach to development and to our commitment to this location in the City and the outstanding value and quality offered by this building. Christopher McPherson, Development Director of Abstract said, “We have had significant occupier interest in this development since completion and it is fantastic that KPMG have seen the merits of our building over the other options available to them after an extensive due diligence process. It is particularly good to be able to confirm this letting so soon after Whyte and Mackay committed to the 4th floor and I believe we will fill the remaining space soon. “Occupiers in Glasgow are waking up to the fact that there are no new schemes which can be delivered in the City until at least 2018/2019 and that assumes a start on site today. Existing Grade A offices are disappearing fast. Joint agents for St Vincent Plaza are CBRE and Ryden. Knight Frank represented KPMG. The first phase of Aberdeen International Business Park is designed to accommodate around 2,400 employees with 1,200 car parking spaces and besides a variety of catering options, includes a gym, a sports hall, 2 squash courts, a medical facility, a nursery/crèche and a shop. Abstract agreed Scotland's biggest letting deal ever with the Norwegian company Aker Solutions on 335,000 sqft of office space in Summer 2014. The resultant investment was sold to Legal & General in October 2014 for a price in excess of £127m making this the second largest investment deal in Scotland for 2014. www.aibp.co.uk. KPMG LLP, a UK limited liability partnership, operates from 22 offices across the UK with approximately 12,000 partners and staff. The UK firm recorded a turnover of £1.9 billion in the year ended September 2014. KPMG is a global network of professional firms providing Audit, Tax, and Advisory services. It operates in 155 countries and has 162,000 professionals working in member firms around the world. The independent member firms of the KPMG network are affiliated with KPMG International Cooperative ("KPMG International"), a Swiss entity. Each KPMG firm is a legally distinct and separate entity and describes itself as such. Posted on November 18, 2015 by Przemek Czaicki. Whyte and Mackay have concluded an agreement to become the first occupier to lease space at Abstract’s St Vincent Plaza development in Glasgow. The Company has committed to relocate from Dalmore House in early 2016 and will take the entire 4th floor of the development comprising 17,726 sq ft. Fit out work will begin shortly. St Vincent Plaza is a brand new speculative ‘Grade A’ office development of 172,280 sq ft arranged on lower ground, ground and 10 upper floors. The building occupies a prominent position in Glasgow City Centre and has been designed to support highly efficient day one occupancy levels from 1 person per 6 sq m.
With a BREEAM ‘Excellent’ environmental accreditation and an ‘EPC B’ rating, the development provides the most cost effective new build City Centre office accommodation anywhere in the UK. Mark Glatman, Chief Executive of Abstract, commented: “We are delighted to welcome Whyte and Mackay as our first tenant at St Vincent Plaza. The building is of the highest quality and the views, even from the lower floors, are stunning. We strongly believe that our developments need to be an asset to our occupiers, not just an operational overhead, and we are confident that we have created the perfect example here – brilliant flexible space, great environmental credentials, and a really competitive pricing point”. Christopher McPherson, Development Director of Abstract said: “Occupier interest in Glasgow has been very strong through 2015 and the number of current enquiries for the City far outweigh the availability of ‘Grade A’ offices – space is letting up fast and there have been no new build starts so the next new building is probably around 3 years away." “Interest levels in St Vincent Plaza since we completed the development have been extremely encouraging and the comments that we have received following viewings of the property are overwhelmingly positive in terms of the quality of the building itself and the accessibility of the immediate location. “Scottish Power are due to complete their HQ opposite us in 2016 and with Santander adjacent, and a number of other significant occupiers in close proximity this is the fastest developing office location in the City. We fully expect further letting announcements to follow very soon”. Joint agents for St Vincent Plaza are CBRE and Ryden. GVA James Barr represented Whyte and Mackay. The first phase of Aberdeen International Business Park is designed to accommodate around 2,400 employees with 1,200 car parking spaces and besides a variety of catering options, includes a gym, a sports hall, 2 squash courts, a medical facility, a nursery/crèche and a shop. Abstract agreed Scotland's biggest letting deal ever with the Norwegian company Aker Solutions on 335,000 sq ft of office space in Summer 2014. The resultant investment was sold to Legal & General in October 2014 for a price in excess of £127m making this the second largest investment deal in Scotland for 2014. www.aibp.co.uk. Whyte & Mackay was founded on the docks of Glasgow in 1844 by James Whyte and Charles Mackay, who had a mission to create a truly Scottish blended whisky. This partnership laid the foundations for the company’s continued growth over the next century, with the company now producing and distributing some of the most highly-awarded and respected whisky and spirit brands. The multi-award winning portfolio includes its flagship Whyte & Mackay Blended Whisky, The Dalmore Highland Single Malt, Jura Single Malt Scotch Whisky, Fettercairn, Glayva Liqueur, and Mackinlay’s. The company also distributes Flor de Caña and RumChata in the UK. Whyte & Mackay Ltd operates in the heart of Glasgow where they have been for over 170 years. The company employs over 470 people across the world, and owns 5 distilleries and a state of the art bottling plant. Posted on November 12, 2015 by PETER RUPPERT. The idea behind the photography was to show a variety of trades and occupations involved in building St Vincent Plaza and produce an archive of faces and details to personalise the building. Posted on July 24, 2015 by Przemek Czaicki. Abstract (Glasgow) Ltd today (18 June) launches St Vincent Plaza in Glasgow, one of the UK's largest and most cost-effective speculative office developments. Today's launch is marked with a unique photography exhibition entitled 'The team that built St Vincent Plaza'; a striking series of portraits of the men and women involved in designing, building and project managing the scheme, as well as a fascinating collection of detail images from throughout the building. The photographs are by Glasgow photographer, Iain McLean. St Vincent Plaza is a landmark development, located on St Vincent Street within the International Financial Services District (IFSD) and opposite the new HQ for Scottish Power. Set for a shell and core completion on 29 June 2015 with the handover of a ‘Category A’ fit-out in September, it will have an end investment value of £75m and be able to accommodate up to 2,600 staff. Rents from just £23 per sq. ft. are significantly lower than standard headline rents in the City, making St Vincent Plaza considerably more cost-effective than other Glasgow 'Grade A' schemes, both in terms of rent and occupational costs. Mark Glatman, Chief Executive of Abstract, said: “Today's launch of St Vincent Plaza marks our completion, on time and to budget, of our first development in Glasgow, which is also one of the largest and most cost-effective in the UK. Our scheme represents a superb opportunity for occupiers - whether local or from further afield - to take space in the City at rents from only £23 per sq. ft. in London-quality space, as our competitors' rents are significantly higher and the Glasgow pipeline is fast diminishing. St Vincent Plaza delivers an extremely high specification and comprises a lower ground, ground and ten upper floors of office space together with 78 car parking spaces. The building offers flexible, virtually column-free floorplates of 17,000 sq ft; a feature penthouse office level with terrace, and some of the best views in the City. It has been designed to a BREEAM ‘Excellent’ standard and an EPC 'B' rating and provides some of the most efficient and environmentally friendly office accommodation in Glasgow. In addition, Abstract is creating a new £1.2m landscaped public space that will link William Street to St Vincent Street, improving access to the IFSD and all that the City Centre has to offer. Just minutes' walk from both Charing Cross and Anderston train stations, St Vincent Plaza will also offer immediate access to the M8 and to Glasgow Airport just 15 minutes away, as well as several bus routes and is within easy walking distance from Glasgow's main retail and leisure zones. The scheme has been designed by Glasgow-based Keppie Design. Bowmer & Kirkland is the main contractor. CBRE and Ryden are jointly marketing St Vincent Plaza. The Abstract Group is one of the most active office developers in the UK and has one of the largest office development programmes of any developer outside of Central London. Abstract is also developing 110,000 sq. ft. close to Gatwick Airport which it has recently prelet to Virgin Atlantic for its new headquarters, as well as Phase 2 of Aberdeen International Business Park. Besides these it is also working with the Carlyle Group on the re-development of the former Colgate factory, now named Soapworks in Salford where it has just announced a 106,000 sq.ft. letting to Talk Talk and further lettings totalling 81,000 including to the Home Office. Posted on June 18, 2015 by Przemek Czaicki. Abstract Securities the developers of St Vincent Plaza, Glasgow’s newest speculative commercial office development is donating much needed funding for a new garden project that is being created for the patients of St Vincent’s Hospice in Renfrewshire. Archie Blair of Abstract Securities, the developer of St Vincent Plaza with Katrina Vine a volunteer from St Vincent’s Hospice at the St Vincent Plaza, Glasgow site. The St Vincent Plaza development team has donated £1,000 to the St Vincent’s Hospice community garden project that launches this month. Kate Lennon, CEO of St Vincent's Hospice added: “We are grateful to Abstract Securities for their kind donation. The generous support from companies like Abstract Securities ensures that St Vincent’s Hospice continues to care for more patients and their families in the local community”. St Vincent Plaza is a landmark development in Glasgow and will be one of the key elements in the next phase of Glasgow’s IFSD on completion in June 2015. It will be the most cost effective new build office developments in the City and in the UK with rents at just £23 per square foot. Visit www.stvincentplaza.com for more information. The Abstract Group is one of the most active office developers in the UK and has the largest office development portfolio outside of Central London. As well as the St Vincent Plaza development, Abstract is developing the 40 acre Aberdeen International Business Park (AIBP) for its client Fornebuporten UK AS (a subsidiary of Norwegian investment company Aker ASA). The site which was acquired in early 2013, is immediately adjacent to Aberdeen International Airport and offers multi-national companies a combination of the best buildings and facilities in the Aberdeen market as well as the closest proximity to the Airport for easy national and international travel. Phase 1 of The Park, comprising 335,000 sq.ft. of office and leisure facilities, was completed and handed over to the tenant, Aker Solutions, on time and on budget on 20 February 2015. Abstract are also speculatively developing the 110,000 sq ft Leonardo Building, close to Gatwick Airport, again offering the most competitive new office space in the South East of England. It is also working with the Carlyle Group on the re- development of the former Colgate factory, now named Soapworks in Salford. Posted on February 25, 2015 by Przemek Czaicki. The striking granite and glass-clad building, by developer Abstract Group and main contractor Bowmer & Kirkland, will provide 172,280 ft of Grade A office accommodation with panoramic views across the city. The state-of-the-art building includes shower rooms, changing facilities and secure internet shopping storage. Posted on July 11, 2014 by Przemek Czaicki. Abstract (Glasgow) Ltd – a wholly-owned subsidiary of Mark Glatman’s Abstract Securities Ltd – has announced that the topping-out of St Vincent Plaza, Glasgow, was completed today, 4th June 2014. The Leader of Glasgow City Council, Gordon Matheson marked the topping-out ceremony, by tightening the final bolt and adding the final shovel of concrete to complete the structure of one of the most competitive office developments in the City and in the UK, with rents at just £23 per square foot. The ceremony featured a tour of the site where the Leader of Glasgow City Council, Gordon Matheson, met construction workers, before heading to the top floor of the 11 storey, 172,280 sq ft development, to mark the topping-out of the building. The main contractor, Bowmer & Kirkland began construction work in November 2013, and it is now week 34 of an 89 week project. The main steel frame of the 11 storey building is complete and work has begun on the external envelope and cladding to the building that will be followed by the internal framework and fit out. The building will deliver an extremely high specification and will comprise a lower ground, ground and ten upper floors together with 78 car parking spaces. St Vincent Plaza will offer flexible, virtually column-free floorplates of 17,000 sq ft; a feature penthouse level office with terrace, and some of the best views in the City. It has been designed to a BREEAM ‘Excellent’ standard and an EPC ‘B’ rating and will provide the most efficient and environmentally friendly office accommodation in Glasgow. As part of the development a new £1.2m landscaped public space that will link William Street to St Vincent Street will be built, improving access to the IFSD and all that City Centre has to offer. Just minutes’ walk from both Charing Cross and Anderston train stations, St Vincent Plaza will also offer immediate access to the M8 and to Glasgow Airport just 15 minutes away, as well as several bus routes and is within easy walking distance from Glasgow’s main retail and leisure zones. Posted on June 4, 2014 by Przemek Czaicki. Abstract (Glasgow) Ltd – a company established by Mark Glatman’s Abstract Securities Ltd – has announced that site enabling work has now been completed, and building work has started, at its speculative, high quality office scheme, 'St Vincent Plaza' in Glasgow City Centre, located at the gateway to Glasgow’s International Financial Services District (IFSD). The building, which is creating approximately 250 new construction jobs, will have an end investment value of around £65m and be able to accommodate at least 2,600 staff when it completes in spring 2015. Significant site enabling work was required to remove the old Living Well Health Club which straddled the site and the adjoining Santander building. This was concluded last week and the contractor started construction of the new office on 14thOctober. St Vincent Plaza will comprise 172,280 sq. ft. of office space, built to a 'Grade A' specification, with rents from just £23 per sq. ft. –significantly undercutting current headline rents in the City. This landmark development, located opposite the HQ for Scottish Power, will be one of the key elements in the next phase of Glasgow’s IFSD, and will not only be the most cost effective new build office development in the City, but will offer one of the best value City Centre office schemes currently being built in the UK. This 'high spec, high value’ development, when complete, will counteract escalating occupational costs by offering businesses the chance to significantly reduce their 'cost per workstation' and buck the trend of rising costs of accommodating staff. A 'BREEAM excellent, EPC B office built to the highest specification, St Vincent Plaza will offer occupiersup to 41% cost reduction against comparable Glasgow City Centre schemes when rent, occupational density, rates and service charges are taken into consideration.The building will comprise a lower ground, ground and ten upper floors together with 78 car parking spaces as well as flexible, virtually column - free floorplates of 17,000 sq. ft.; a feature penthouse office level with terrace, and some of the best views in the City. Providing extremely efficient and environmentally friendly office accommodation, the scheme will be delivered into a market where available ‘Grade A’ supply continues to diminish. Christopher McPherson, development director of Abstract, said, “Following an intensive period of four months, we are very pleased to have now completed site enabling works and started to build our St Vincent Plaza scheme. In this building, we are bringing a very innovative concept to the market; which is Grade A space at a huge discount to any other City Centre schemes. What we are offering is office space that absolutely does not compromise on quality, but simply cannot be found at this cost anywhere else – our ‘cost per workstation’ will not be replicated anywhere else either in Glasgow or many other City Centre locations in the UK. The scheme has been designed by Glasgow - based Keppie Design. Bowmer & Kirkland have been appointed as the contractor. CB Richard Ellis and Ryden have been jointly appointed to market St Vincent Plaza. CGI shows: St Vincent Plaza, which is being built at 303 St Vincent Street by Abstract (Glasgow) Ltd.
Posted on October 17, 2013 by Przemek Czaicki. Abstract (Glasgow) Ltd– a wholly-owned subsidiary of Mark Glatman’s Abstract Securities Ltd– has announced that it has completed its purchase of 319 St Vincent Street and on siteconstruction works are due to commence in a matter of days for its speculative high quality office scheme, 'St Vincent Plaza' in Glasgow City Centre, located at the gateway to Glasgow’s International Financial Services District (IFSD). The building, which will create approximately 250 new construction jobs, will have an end investment value of £65m and be able to accommodate around 2,000 staff when it completes in early 2015. St Vincent Plaza will comprise 172,280 sq. ft. of office space, built to a 'Grade A' specification, with rents from just £23 per sq ft - significantly undercutting current headline rents in the City. This landmark development, located opposite the HQ for Scottish Power, will be one of the key elements inthe next phase of Glasgow’s IFSD, and will be the most cost effective new build office development in the City. The building will deliver an extremely high specification and will comprise a lower ground, ground and ten upper floors together with 78 car parking spaces. St Vincent Plaza will offer flexible, virtually column - free floorplates of 17,000 sq ft; a feature penthouse office level with terrace, and some of the best views in the City. It has been designed to a BREEAM ‘Excellent’ standard and an EPC 'B' rating and will provide the most efficient and environmentally friendly office accommodation in Glasgow, delivered into a market where available ‘Grade A’ supply has all but disappeared. Christopher McPherson, development director of Abstract added, “St Vincent Plaza will be the most competitive speculative ‘Grade A’ office development of its kind to be completed in Glasgow for several years and is likely to be one of only a few speculative office schemes of its size outside London. Starting construction underlines our commitment and confidence in the IFSD and the City as a whole, and we are confident that the scheme will let at an early stage. “By coming to the market with a top - quality product at a time when there is a dearth of ‘Grade A’ officespace and quoting rentals from just £23 per sq. ft, we are significantly undercutting the established Glasgow market without compromising on quality and offering exceptional value for money as well as significantly reduced operational costs compared to existing City Centre stock. Just minutes' walk from both Charing Cross and Anderston train stations, St Vincent Plaza will also offer immediate access to the M8 and to Glasgow Airport just 15 minutes away, as well as several bus routes and is within easy walking distance from Glasgow's main retail and leisure zones. The scheme has been designed by Glasgow - based Keppie Design. Bowmer & Kirkland have been appointed as the contractor. CB Richard Ellis and Ryden have been jointly appointed to market St Vincent Plaza. CGI shows: St Vincent Plaza, which will be built at 319 St Vincent Street by Abstract (Glasgow) Ltd.
-Established in April 2000 by Mark Glatman, the Abstract Group of Companies specialises in commercial property investment, development and venture capital financing. The management team at Abstract brings together combined experience of over 6 million sq ft of business space development across the UK and Europe. The team is highly experienced at working directly with major property owners and corporate end users, handling all aspects of their property requirements. St Vincent Plaza, Glasgow is part of the Abstract’s new ‘Austerity Office’ development programme. Last June, Abstract started work on “Renaissance”, Croydon a 100,000 sq.ft. ‘Grade A’ office scheme with rents from just £22 psf –significantly undercutting rental values for other prospective new builds in Croydon and the South East and representing the most cost effective new build offices within the M25. This will complete in early August 2013.
Business Park on a 40 acre site opposite Dyce Airport. Posted on April 25, 2013 by Przemek Czaicki. Abstract (Glasgow) Ltd – a wholly-owned subsidiary of Mark Glatman’s Abstract Securities Ltd – has announced that planning consent has been granted for its speculative 172,280 sq. ft. 'St Vincent Plaza' development for Glasgow City Centre. This 'Grade A' building will offer a specification rarely seen outside Central London and will comprise basement, ground and ten upper floors together with 78 car parking spaces. The development is likely to be one of the only speculative office schemes of its size in the UK and will be priced from just £23 per sq. ft. – a significant discount on current headline rents in the city. Now that planning consent for this landmark development, located at the gateway to Glasgow's Central Business District, has been granted, site enabling works followed by full construction will start in the next few weeks. The scheme will complete towards the end of 2013. Just minutes' walk from both Charing Cross and Anderston train stations, St Vincent Plaza will also offer immediate access to the M8 as well as several bus routes and is within easy walking distance from Glasgow's main retail and leisure zones. St Vincent Plaza will offer flexible, virtually column free floorplates of 17,000 sq ft, a feature penthouse level with terrace, and some of the best views in the City. The building is designed to a BREEAM ‘Excellent’ standard and an EPC 'B' plus rating. It will provide the most efficient and environmentally friendly office accommodation in the city and will be delivered into a market where available ‘Grade A’ supply has all but disappeared. The scheme has been designed by Glasgow-based Keppie Design. Bowmer & Kirkland have been appointed as the contractor. CB Richard Ellis has been appointed to market St Vincent Plaza with a second agent to be appointed duly. Established in April 2000 by Mark Glatman, the Abstract Group of Companies specialises in commercial property investment, development and venture capital financing. The management team at Abstract brings together combined experience of over 6 million sq ft of business space development across the UK and Europe. The team is highly experienced at working directly with major property owners and corporate end users, handling all aspects of their property requirements. Posted on February 6, 2012 by Przemek Czaicki. Abstract (Glasgow) Ltd – a wholly-owned subsidiary of Mark Glatman’s Abstract Securities Ltd – has announced that it has exchanged missives to acquire a site at 319 St Vincent Street, Glasgow, on which it will speculatively build 172,280 sq. ft. of 'Grade A' office space, priced from £23 per sq. ft. (a significant discount to headline rents in Glasgow). The building – provisionally known as St Vincent Plaza – will offer a specification rarely seen outside Central London and will comprise basement, ground and ten upper floors together with 78 car parking spaces. The development is likely to be one of the only speculative office schemes of its size in the UK. A detailed planning application for this landmark development, located at the gateway to Glasgow's Central Business District, is being submitted today following extensive discussions with Glasgow City Council and construction will commence in Spring 2012. Completion of the scheme will be in the third quarter of 2013, ahead of Glasgow's Commonwealth Games. Just minutes' walk from both Charing Cross and Anderston train stations, St Vincent Plaza will also offer immediate access to the M8 as well as several bus routes and is within easy walking distance from Glasgow's main retail and leisure zones. Abstract’s Development Director, Christopher McPherson, said: "St Vincent Plaza has been designed with an extremely high 'Grade A' specification, including, flexible, virtually column free floorplates of 17,000 sq ft, a feature penthouse level with terrace, and some of the best views in the City. The building is designed to a BREEAM ‘Excellent’ standard and an EPC 'B' plus rating. It will provide the most efficient and environmentally friendly office accommodation in the city and will be delivered into a market where available ‘Grade A’ supply has all but disappeared." Mark Glatman, Chief Executive of Abstract Securities, said: “We have exchanged missives to purchase a key site in Glasgow City Centre, on which we will speculatively build 172,280 sq ft of office space with a specification only usually found in central London. St Vincent Plaza has been designed by Glasgow-based Keppie Design. Bowmer & Kirkland have been appointed as the contractor. CB Richard Ellis has been appointed to market the space with a joint agent to be announced imminently. Posted on November 11, 2011 by Przemek Czaicki.